Stag’s Leap, Stags’ Leap, or Stags Leap? A tour of one of the oldest wineries in the Napa Valley clears up the question and reveals the colorful history of the region. In 1888, a young couple, Horace and Minnie Mizner Chase, found what they believed to be the perfect volcanic rock and rich clay soil in which to plant their vines. As the story was told by Ken Swanson, our knowledgeable guide, this property on the east side of Napa Valley was riddled with stags. Poachers constantly on the prowl forced the stags to climb higher into the steep hills until they could go no further. The only option — a leap of faith to the river below. 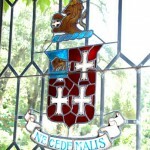 Thus the name Stags’ Leap Manor was born. By 1895, the Napa Valley wine business was booming and Stags’ Leap was producing upwards of 40,000 gallons of wine annually. Following the outbreak of the vine disease phylloxera, and the institution of prohibition, Stags’ Leap was forced to stop producing wine, causing it to approach financial ruin. In an effort to make money, rooms in the manor were rented. The Stags’ Leap Post Office was established in the basement and next to that, a speakeasy, so it quickly became the ideal place to collect mail and have a drink. This led to the transformation of the manor into one of the prominent Napa Valley retreats at a time when resort and spa business was growing. 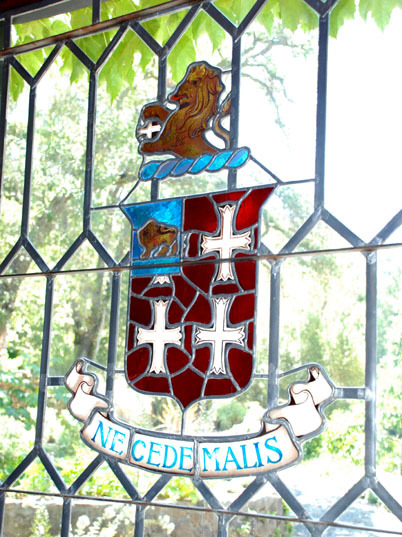 Ne Cede Malis is Latin for “Never give into Evil.” Not only is this the name of their best Petite Syrah, but also the theme throughout the history of the winery. Stags’ Leap Manor catered to Hollywood’s finest in need of respite from their hectic city lives, but more colorful legends of bootleggers and gangsters, ghosts and gypsies, formed in the years that followed. 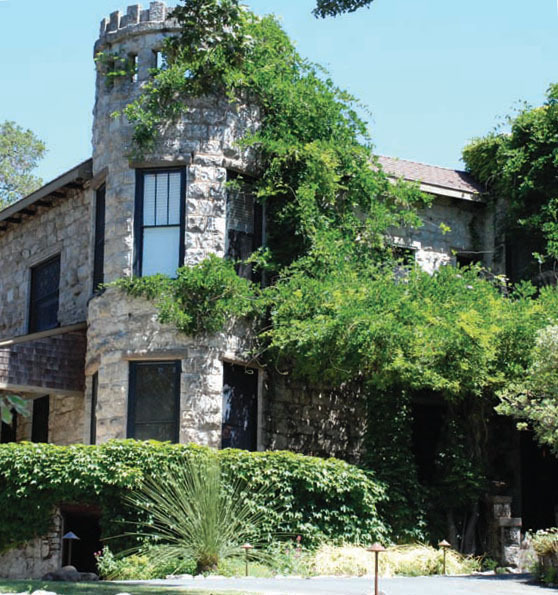 A former winemaker, Robert Brittan, says he came face-to-face with a ghost on the second floor of the manor. He describes the ghost as a young lady, fashionably dressed and unmenacing. She is thought to be a prostitute who died in the house during the time the Manor was used as a brothel for the soldiers coming home from the war. In the early 1970s, nearly a century after the Chases planted their first vines, Carl Doumani (who took over the Chases’ 240 acres) and Warren Winiarski both founded their wineries and both named them Stags Leap but with slightly different punctuation: the original Stags’ Leap Winery for Doumani, and the new Stag’s Leap Wine Cellars for Winiarski. Winiarski sued, but Doumani countersued, fueling a historic turf war. After years of litigation, a judge finally ended what had been billed as the “War of the Apostrophe.” It was determined that Stags’ Leap Winery, even with the longer history, has no lawful rights over the name. 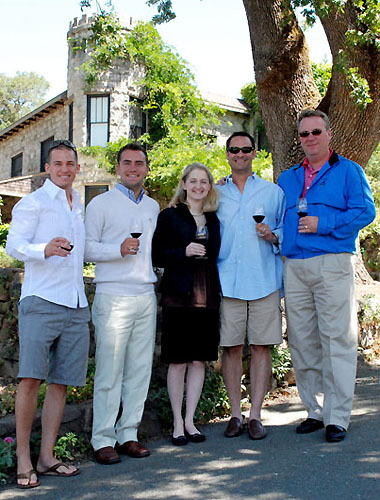 Adam Billings, Patrick McGinn & Pamela Tweedell of iMi Agency – AJ Freeman & Russ Kuck of Foster’s Wine Estate outside of Stags’ Leap Manor. 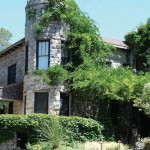 While Stags’ Leap Winery lays stake to the origins of the name, Stag’s Leap Wine Cellars has its own claim to history. On May 24, 1976, a wine tasting took place in Paris that changed the world’s view of California wines forever. The 1973 Stag’s Leap Wine Cellars S.L.V. Cabernet Sauvignon – the first vintage produced with grapes from vines a mere three years old – was judged the best against top-ranked Bordeaux. Special thanks: to AJ Freeman and Russ Kuck at Foster’s Wine Estates for sharing this wonderful experience with the iMi team.